Born in Edinburgh in 1856, Bernard Sayers began his working life as an acrobat, not picking up a golf club until he was 16. He finished second in the 1888 Open which helped establish his reputation and boost his main business, giving golf lessons. So successful was he with this that he taught in Monte Carlo over the winter months. The gambling bug must have bitten him as he played a number of high-purse matches in his career, against Willie Park, Andrew Kirkaldy, Douglas Rolland and several times against Willie Campbell. He also played foursomes against the Kirkaldy brothers with his brother-in-law, Davie Strath. 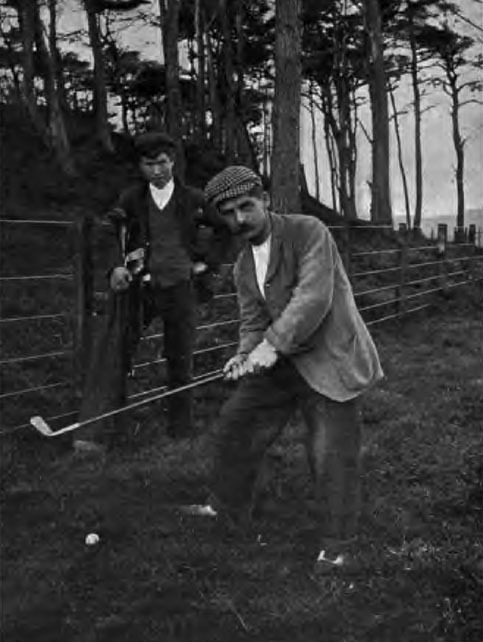 ‘The Golf Book of East Lothian’ (1896) tells us that Davie Strath had a great reputation for ball-making in North Berwick and, after his untimely death, there was great competition at auction for his mould. James Law of the Scotsman newspaper, who had been one of Sayers’ first pupils, secured the mould for him and provided him with £100 worth of the very best gutta percha. Sayers soon became as a first class ball-maker with Thornton & Co in Edinburgh being one of his major customers. He started major club production in North Berwick in 1910 and is known for the innovations of the Stopum iron, a heavily grooved iron to impart backspin and the Dreadnought driver. His clubs are recognised by the bird cleekmark, in the early days one standing upright, tail down like a crow and, in later years, bending down with tailfeathers up in the manner of a wren. He is also commemorated by a putter made by his son, called the "Benny", which has a grooved sole to reduce resistance when moving across the green.